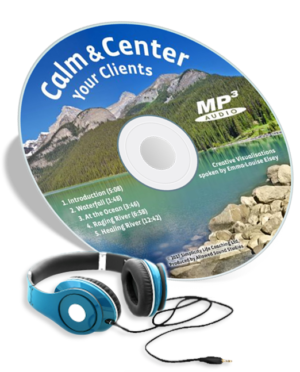 Calm and center your clients with 4 water-themed Guided Meditation Scripts (1 min, 3 min, 7 min & 12 min). Includes accompanying audios & user guide. The perfect relaxation tool! These guided meditation scripts calm your clients using 4 different water-themed visualizations. 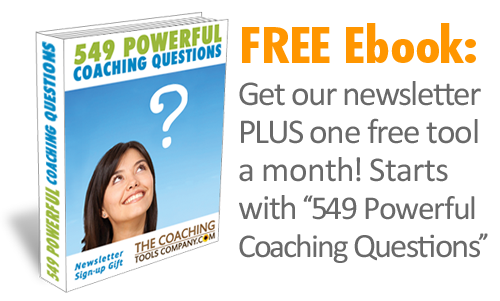 Help your clients leave their worries behind and become more grounded, centered and coachable! Position yourself as a "relaxation" expert & give clients a personal experience of guided meditation. Different length (1 min, 3 min, 7 min & 12 min) meditation scripts - so no matter how busy you are, there's always time! 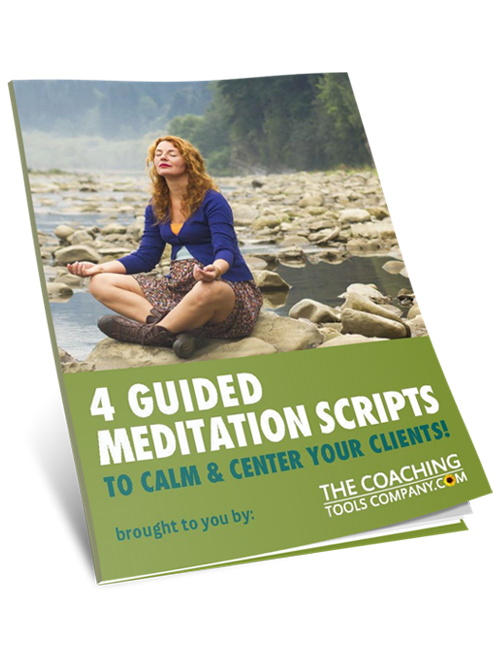 Ebook includes valuable tips on how to read a guided meditation script effectively! These accompanying audio files are read by Emma-Louise Elsey. NOTE: These files are digital MP3 files, NOT a physical product. Choose whether to play the audios or read the meditation scripts. Contains 5 Audio Files - Introduction and 4 Guided Meditations; Waterfall, At the Ocean, Raging River and Healing River. 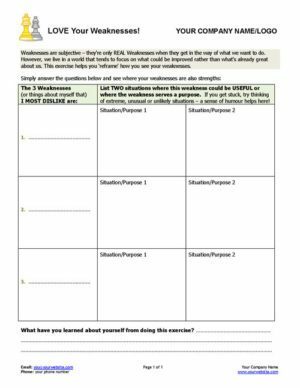 Share the audios as calming homework for your clients or use in sessions, workshops and webinars. Use the audios as a calming tool for yourself. 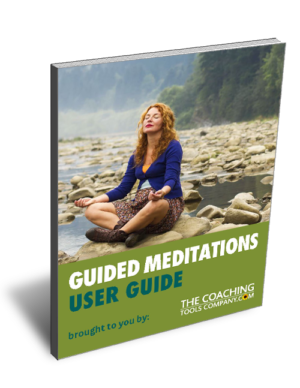 This user guide shares a background to guided meditation, includes details about the product contents and more to help you love this Guided Meditation Scripts Kit! 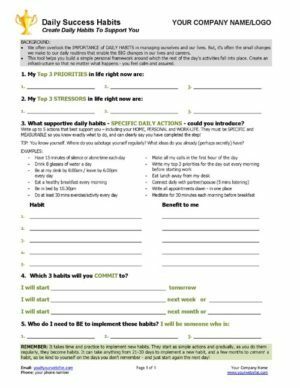 Use your Guided Meditation Scripts with confidence! Get great ideas for WHEN to use meditation scripts with your clients. 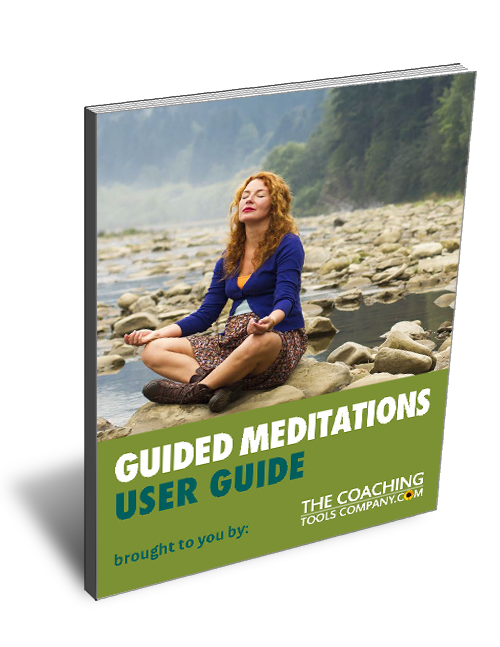 Also includes why, how and who you can use guided meditation scripts with! Lower your clients' stress levels in as little as a minute or so! Help your clients focus on their session, leave their worries behind and become more grounded and centered. Short, varied length meditations are easy to incorporate into a busy life or coaching session. Once experienced, each guided meditation becomes a new tool your clients can use on their own. These guided meditation scripts use NLP and Ericksonian Hypnosis techniques including "embedded commands" to help clients relax fast. Includes tips on how to read guided meditation scripts effectively. Great in session, for homework, workshops and group coaching too! 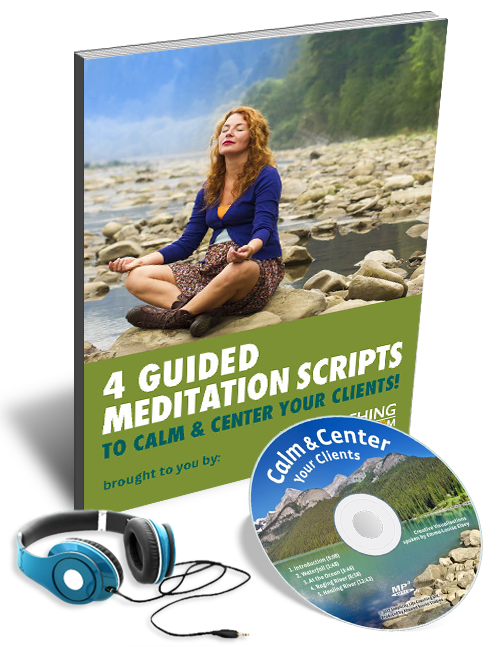 This guided meditation script product is intended to help you help your clients find calm. Relax, de-stress and center your clients in their bodies using these 4 different water-themed visualizations. 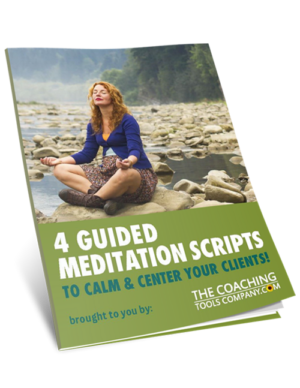 These short and simple 1 minute, 3 minute, 7 minute and 12 minute guided meditation scripts vary in length so no matter how little time you have - you can help your clients find calm! 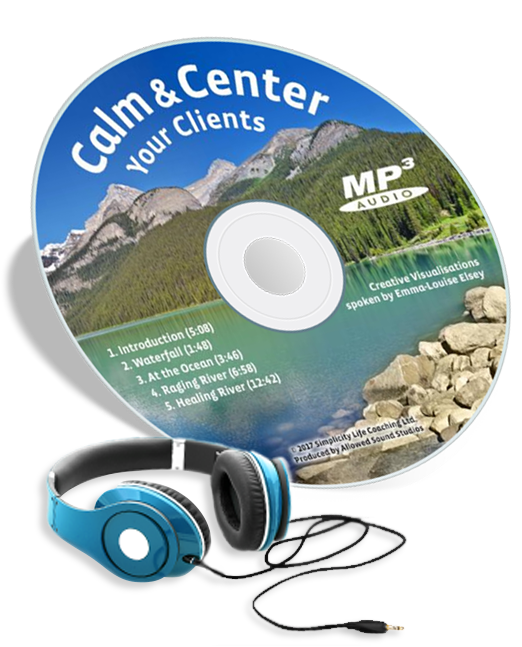 This product gives you the choice of either reading the guided meditation scripts out loud to your clients, or playing the MP3 audio files to your clients or workshop attendees, in session or perhaps at a workshop. You may also send the MP3 audio files to your clients  for their own use eg. as homework. You could even use the audio files for yourself. 4 x Guided Meditation Scripts in a .pdf eBook (including tips on how to read guided meditations most effectively). 5 x Accompanying Audio Files in .mp3 format (read by Emma-Louise Elsey). A User Guide in a .pdf eBook (including why, how, when and who to use guided meditation scripts with). Each guided meditation uses a different water-themed visualization to help your clients leave their cares and worries behind and become more grounded, centered and peaceful. as per our licensing terms, you may share the audio files in the process of coaching your clients, workshop attendees or potential clients ie. 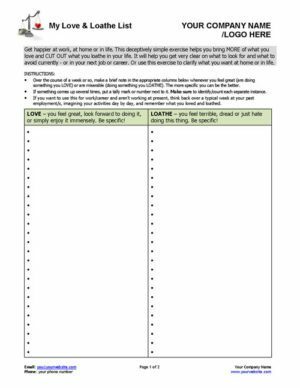 as homework, during a one-on-one or group coaching session or at a workshop you're delivering. However, you may not make the audio files publicly available eg. via your website, or any other website. 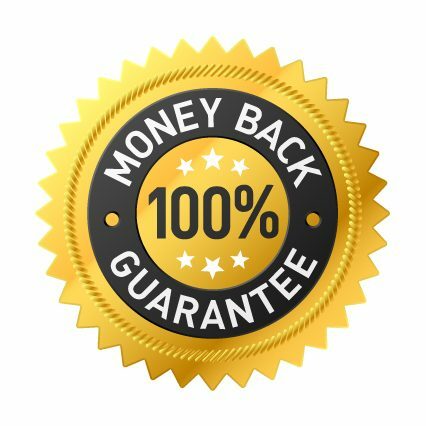 This includes but is not limited to; making the audios available in a private members' area on your website, posting the audios on social media, using the audios as a giveaway in your newsletter or with newsletter sign-up, using the audios as a bonus or gift in a blog post, product or other marketing project and including our tools in a page of free resources for your clients.